Sovran wine gems the ultimate accessory for the wine lover : Chill your wine or beverage without diluting it. What's included: Set of 4 stainless steel wine gems, premium gift box, storage pouch. ADD A TOUCH OF CLASS TO EVERY GLASS - Sovrano's stylish Wine Gems are made from food safe stainless steel and will never stain or rust. These reusable wine chillers are sure to be a conversation piece at any get together. ELEGANT ALTERNATIVE TO ICE - Many people enjoy chilled wine but are too embarrassed to put ice in their wine. Wine Gems provide a stylish and functional alternative to keep both red and white wines chilled without diluting your favorite beverage. NEW MUST-HAVE WINE ACCESSORY - Each package comes with four Wine Gems, which allows wine drinkers the option of using a single Gem or multiple Gems depending on the type of wine and personal taste preferences. Wine Gems can also be used as an alternative to whiskey stones or as a chiller for champagne, spirits, soda or any other beverage of your choice. BEAUTIFUL GIFT PACKAGING - Give the wine lover in your life something unique, thoughtful, and unexpected. 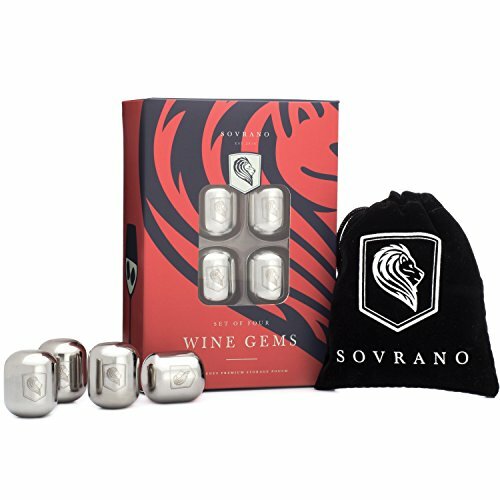 Each Wine Gem has the Sovrano logo laser etched and every package includes a Sovrano storage pouch for safe keeping. Present Wine Gems to your favorite wine lover on Mother's Day, Father's Day, A Special Birthday, Anniversary or any occasion. ORDER WITHOUT RISK - Click 'Add to Cart' and a lifetime warranty from Sovrano will automatically be applied to your order. Simply contact Sovrano directly if you have any issues with this product. If you have any questions about this product by Sovrano, contact us by completing and submitting the form below. If you are looking for a specif part number, please include it with your message.